I put 'the mango tree' on top because this trip is dedicated to the peaceful time I spent at this joint just chilling and eating excellent food. It was very hot. We finished Bijapur in a hurry by 1700hrs, exhausted. The plan was to head for Badami for the night. We headed down the Bagalkot road. But a cop on the way said the NH-13 was better. Head straight down south and then turn right, he said, the interior roads are very bad. So we headed down the NH-13 at about 1800hrs. This road is straight. For kilometres. The night was dark. The land lonely. The road full of trucks. Hundreds of them. It was a very tough and nerve racking drive for me, especially since the lazik surgery has screwed my night vision. We missed the Badami turn. We contemplated staying in small towns on the way. But finally kept on to Hospet. By 2300hrs we were at the outskirts of Hospet, a large town in central Karnataka. 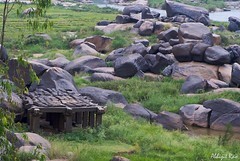 This is the jumping spot to Hampi which lies about 14km away. We found a hotel (but no food) and retired for the night. Next morning we headed for Hampi and three days of relaxation. The wet rocks r as good as lively. Nice shot mann!! Mango Tree, brings forth some serene joyous memories of time spent there. 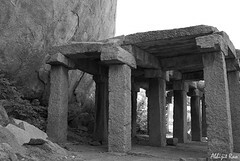 The ruins of Hampi have this haunting, beautiful, peaceful air about them.